Unsweetened Edensoy is intelligently cooked 100 percent U.S.A. family farm organic soybeans. We visit each grower, their farms, and families regularly. Long term ingenious organic farming has created rich, vital soil that produces food brimming with energy, superior taste, and nutrition. 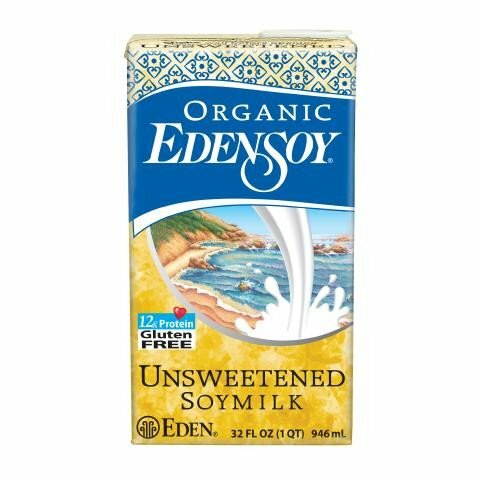 Unsweetened Edensoy provides heart healthy soy protein - the highest of all soymilk with 12 grams per 8 ounce serving, 4.5 grams of healthy essential fatty acids (EFAs) - omega 3, 6, and 9, and high energy complex carbohydrates. Edensoy is smooth, delicious, and nourishing organic soymilk. All its soy protein is from Midwestern whole beans with all eighteen amino acids; not from the ubiquitous soy isolate. In January 1983 Eden discovered soymilk made using techniques pioneered at Cornell University. Engineered in Japan, Eden improved the ingredients and Edensoy was introduced in July 1983. Its phenomenal success created a new grocery category - nondairy liquid food. Soybeans require specific preparation and thorough cooking to transform them into easy-to-digest, nutritious food. Edensoy is skillfully made at our certified organic Michigan plant with over 240 continuous quality control checks. It embodies our thorough research into how best to choose and prepare soybeans. From the double reverse osmosis purified water, a patented enzyme invalidator, to the Swedish aseptic packaging equipment, every step contributes to greater value and the best possible nourishment from whole soy. Edensoy is the only soymilk made in the USA that is properly prepared to nurture human beings. 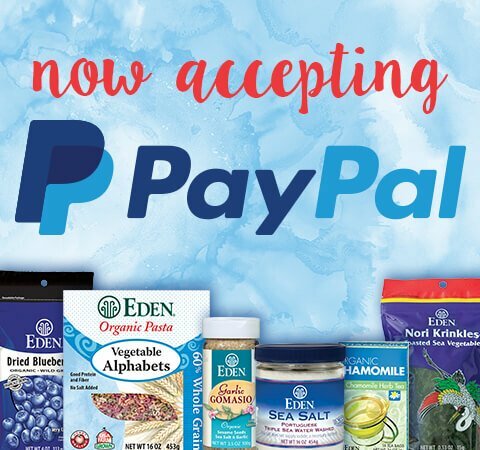 Eden Foods submitted Edensoy to the Non-GMO Project (The Project) on August 18, 2008. After thorough scientific study, covering everything from seed to aseptic carton, Edensoy became the first soymilk in North America to be verified compliant with The Project's standards for avoiding GMOs (genetically modified organisms). Soybeans today are predominantly genetically engineered. 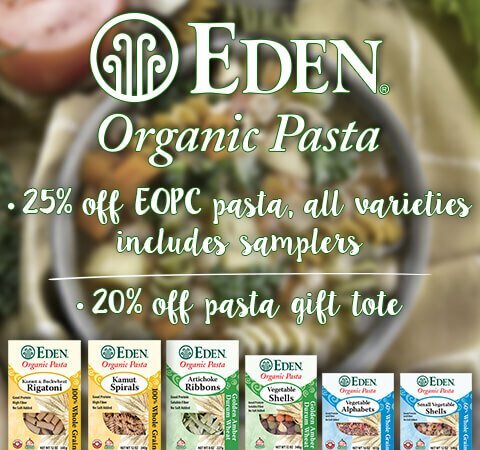 In 1993 Eden pioneered and perfected a process to avoid genetically engineered organisms and their derivatives in food. To keep Edensoy GMO free much work is demanded including multiple tests of all seed, in growing, at the elevator, and at the manufacturing plant. We avoid use of pharmaceutical enzymes and know all farms, fields, farmers, and suppliers. When the New York Times tested eleven soy and corn based foods, only one tested GMO free - Edensoy. Seventy-three percent of Edensoy's package is from certified sustainable forests that ensure biological biodiversity and protect endangered species. They require no refrigeration in transport or storage and are recyclable. Greenhouse gas producing refrigeration is unnecessary until the package is opened at home. The EPA reports pollution from refrigeration has increased exponentially since the 1990s. Edensoy avoids unnecessary energy use. For aseptic package recycling centers contact your city and state recycling program or search for the nearest recycling facility at: www.recyclecartons.com. Soybeans have been important food for at least 5,000 years. Western science confirmed soy as very healthy food. In 1999 the FDA recognized the role of soy in reducing cholesterol saying, "25 grams of soy protein a day, as part of a diet low in saturated fat and cholesterol, may reduce the risk of heart disease." Whole organic soy foods, such as Edensoy, best provide the desired benefits. Whole food sources of phyotonutrients are always better than isolates and chemical imitations. The FDA further says, "Diets low in sodium may reduce the risk of high blood pressure, a disease associated with many factors." Unsweetened Edensoy is very low sodium with no salt added, rich in protein, and is a good source of potassium, iron, folate B9, magnesium, and copper. It provides 75 mg of naturally occurring soy isoflavones and is gluten free. Edensoy is made with all natural whole food ingredients, providing the highest quality soy protein and a whole spectrum of balanced nutrients. As soy became popular for health benefits, commercial food processors rushed through a series of shortcuts to exploit this. Though labeled "healthy," most soy foods are made with cheap processes and ingredients; cheap imported soy and grain, hexane extracted soy protein, and treated with a variety of toxic petrochemicals and unsavory additives. Most use undeclared chemical flavor maskers and refined sugars. Evaporated or dried cane juice is sugar, and organic sugar is an oxymoron. Edensoy is the best choice in seeking high quality, pure food. Use Unsweetened Edensoy on cereal, and to make smoothies, freeze pops, creamy soups, sauces, gravies, breads, pastries, and desserts. Use it cup-for-cup when substituting for other milk (even in soap making). 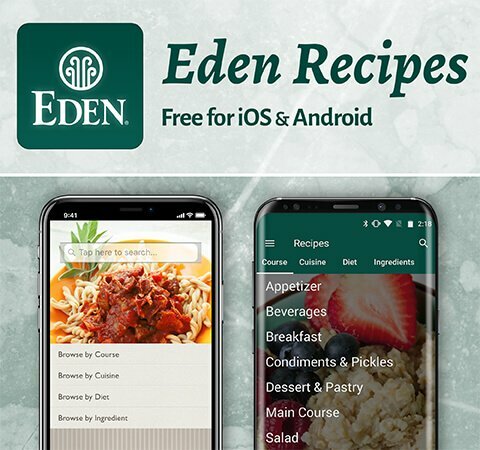 For soy buttermilk place 1 tablespoon of Eden Organic Apple Cider Vinegar or lemon juice in 1 cup of Unsweetened Edensoy and let sit 2 to 3 minutes until thick, then use as you would dairy buttermilk in baking. Browse over 225 soymilk recipes.